Surprise! Here’s another one of the zombie portraits I made for backers of “The Map of Zombies” project. 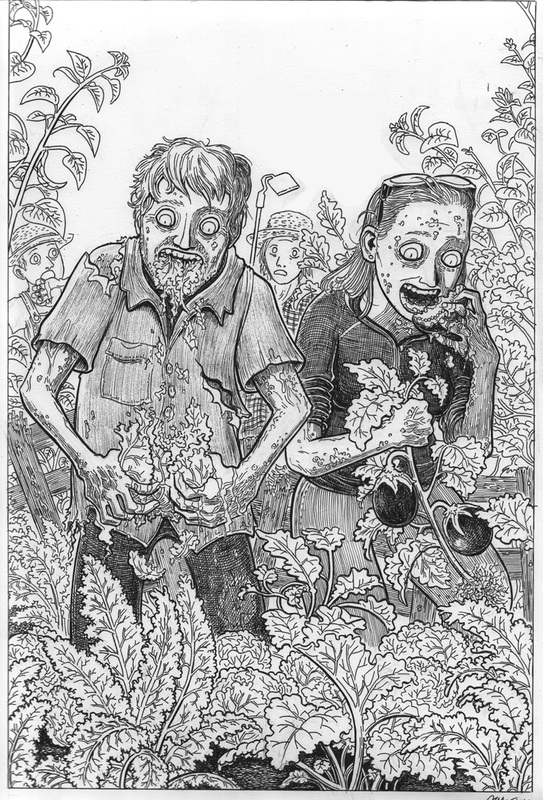 My assignment this time was to draw vegetarian zombies, so these two undead are chowing down on cabbage, Thai eggplants, etc. Their ghoulish stares perhaps make them look more threatening than was strictly necessary, considering all they’re eating is plant matter. OTOH, wouldn’t hordes of plant-eating undead be an ecological catastrophe, like uncontrolled livestock grazing? Horrifying! Got a copy of a SiFi disaster novel called, “The Last Blade of Grass.” Now that is horrible. People are starving, violence is at an all time high and of course once all the starved cattle are killed and eaten humans are all that is left as the world dies. Reading “The Death of Grass” in 2014, its pre-globalism perspective also feels weird, although I don’t know how much that’s the reality of the ’60s or the visionary/writing failures of the author… I feel that even 50 years ago, there’d be more of a panic as the entire outside world dies of crop failure, but in “Death of Grass” the protagonists seem almost totally unconcerned with the grass-killing plague which has devastated the rest of the world, and they don’t start caring until it conquers Britain. IT reminds me of the scene in Stephen King’s Cell where the zombies are eating pumpkins. Though remembering that is an attempt to inject humor into this. Yes, these zombies are scary. No, the title is “No Blade of Grass” published in 1957. I checked and found I had garbled the title. I have the Signet edition. By John Christopher. He made it global since the first creation of the accidental plague happens from China and several other places contribute to its creation and it is affecting everyone. The Cold War has barely started and the World War had been over for just 12 years. I was born in that year. Sure the current incarnation of “zombies” are scary since they act like ghouls wanting to eat we the living. They were us.